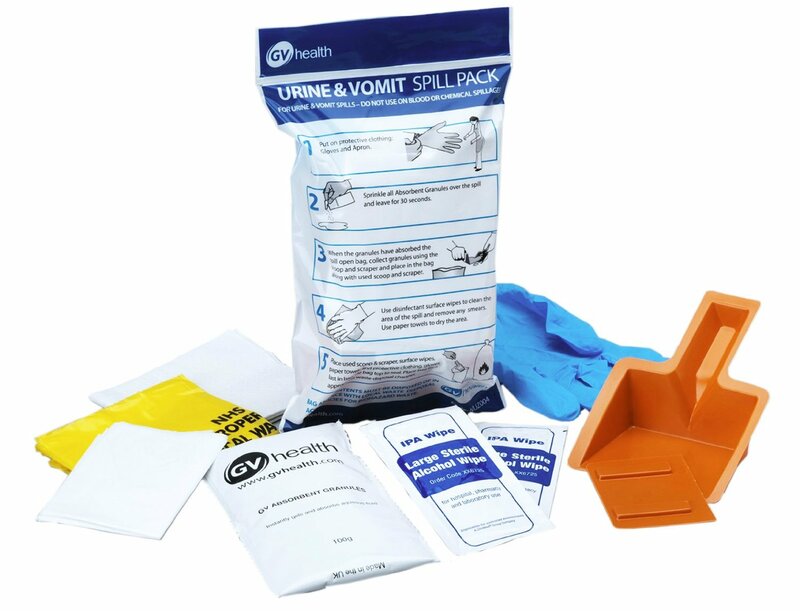 GV Health urine and vomit cleaning packs are used to clean and decontaminate areas where spillages of urine and vomit have taken place. They are safe for use by non-specialist staff and include personal protective equipment for users as well as specialist cleaning/decontamination agents. Packs can be purchased for stand-alone use or as refills for complete biohazard spill kits (ref. MJZ002). Pack Contents 1x pair gloves, 1x apron, 1x absorbent granule sachet, 1x scoop and scraper, 2 x packs of anti-bacterial disinfectant, surface wipes, 1x clinical waste bag, paper towels and illustrated instructions.